The world’s longest Slip n’ Slide extends from Mexico to Southern California. This is also the world’s most dangerous Slip n’ Slide. Every year, 400 people die as a result of belly-gliding across a patchwork of plastic from poverty into opportunity. Injuries occur frequently, and participants usually take part at night. Often the father is the first to go. Says his goodbyes, sprints from the front lawn, and charges into the darkness head-on, through stagnant water and past border agents that await him. Even if he slides from one end to the other, he must hide from deportation. Sometimes the whole family travels together. One by one, they ease onto the plastic, often lead by a man they’ve never met, but whom they paid to navigate them safely to the other side. The fun occurs when the ride is over and sliders are allowed to start new lives. Limp bodies sprawled across the land like lost carcasses equals failure. 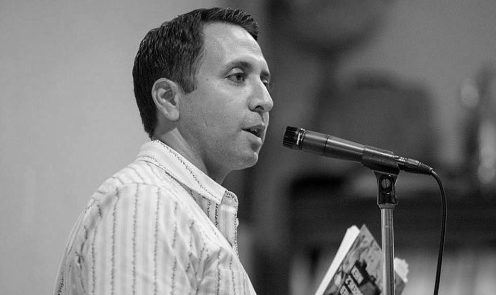 Daniel Romo is the author of Romancing Gravity (Silver Birch Press, 2013) and When Kerosene’s Involved (Second Edition, Mojave River Press, 2014). His poetry can be found in The Los Angeles Review, Gargoyle, MiPOesias, Hobart, and elsewhere. He teaches English and creative writing, and accepts and rejects prose poems as the Poetry Editor for Cease, Cows. He lives in Long Beach, CA and at danielromo.net.